The Wolf of Wall Street doesn't beat around the bush. It really doesn't. If there is one thing I hate in a biopic, it's when the director or production team choose sides with the main character, whether it be a good or bad or normal one or whatever. Trying to show something exactly as it happened without leaning a little one way or another is very difficult, I understand that, but when the right people with the right goals are put on the right projects, this film happens. Martin Scorsese must be high again, because the film is a non-stop roller coaster of excellence. Not a single boring moment was to be found in this entire film, because of its unique style and perfect (let me type it again) perfect tone to underline what I love about Scorsese and his filmmaking style and movies and filmmaking and storytelling in general. 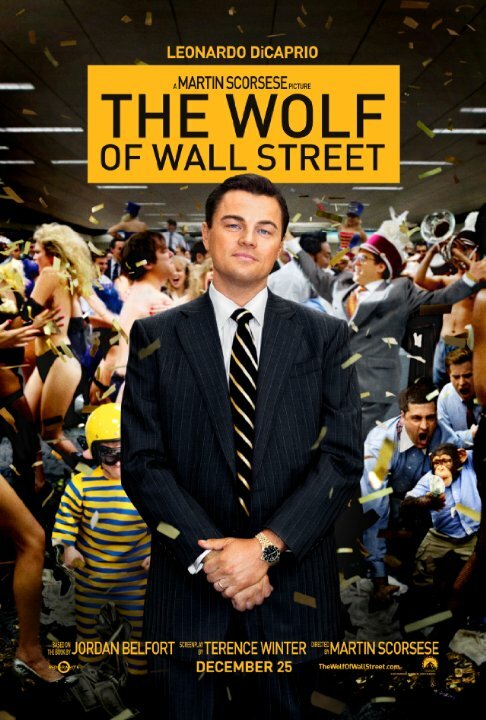 Leonardo DiCaprio (although this is nothing new) is outlandish and perfectly casted as Jordan Belfort. Once again, Oscar-worthy, and most likely once again, snubbed. The screenplay is very self-conscious and never gets in over its head. There are similar themes from other films such as of course the legality concern and swearing and drugs, but it creates an entire other formula, often breaking the fourth wall with DiCaprio and actually appreciating its audience's capability of processing information, a fact some biopics nowadays have not learned to process. It's very straightforward and direct with its expression of characters and events, and I mean that. It is so ballsy and obnoxious, that every line out of DiCaprio, or Jonah Hill or any actor's mouth for that matter, seemed hilarious. It's never forgiving, it never lingers, it's never sentimental, it's just in your face. And that's just what I love to see. I was also glad to see an unexpectedly good performance from Jean Dujardin. Its only flaw may have been its main strength as well, its tone. I still stand by my statement, Scorsese absolutely nailed the tone, going for an extremely concentrated three hours, but it does come off as overly ambitious at times. And aspects of the ending left me a little cold and surprised that it ended so suddenly. It made me feel like there was all this build up, which never amounted to anything greater happening to the character. I guess that depends on the character and if they chose to stick to the original story or not, but either way, that's my gripe with it. And, I would have liked to see more than five minutes of Matthew McConaughey. Just saying, the guy's making a comeback. Other than that, The Wolf of Wall Street is the ultimate biopic. What's not to love about Martin Scorsese's immaculate, speedy, rough-cut style and such performances so over-the-top and lovable? If you want to switch off and enjoy some laughs and possibly some tears, or analyze it to death, either way this film will work splendidly in both categories, because the man behind it all knows what he wanted, and most importantly, what you wanted.